One day at home, Stephen heard voices in his head. He thought the army was speaking to him. The voices were saying he must take his family and leave home. They said if he did not escape, the army would come and kill them all. Stephen told his family about the voices but they ignored what he said. The voices in his head grew louder. They were now telling him that if he and his family didn’t leave, he must kill them before the army arrived. His family, confused by Stephen’s ideas, again refused to leave their home. The next morning, Stephen murdered his wife and three children. The next thing Stephen remembered was finding himself at Chikurubi Maximum Security Prison's psychiatric unit in Harare, Zimbabwe. Médecins Sans Frontières/Doctors Without Borders (MSF) has been running a mental healthcare programme here since 2012. As a new inmate in the mental health wing, Stephen was assigned a clinical psychologist: MSF's Emmerson Gono, who had nearly five years' experience working in the prison. MSF clinical psychologist Emmerson Gono, who helped treat Stephen. When Stephen first arrived, Emmerson asked him if he knew why he had been imprisoned. However Stephen’s psychosis had subsided and he couldn’t remember anything from the previous three weeks. After Emmerson’s careful explanation, and upon realising what he’d done, Stephen was inconsolable. According to Zimbabwe’s Ministry of Health and Child Care, there are at least 1.3 million people living with mental illness in Zimbabwe. Despite the growing number of patients, mental health services, including staff and drugs, remain in dire shortage across the country. Just 20 registered clinical psychologists and nine public Mental Health Institutions exist for a population of over 14 million people. This means that for many Zimbabweans, mental health support is out of reach, either physically or financially. An MSF psychiatric nurse checks a patient in the mental health hospital run by MSF. The patient lies on the ground so she can’t fall out of bed. Stephen is one of about 300 inmates at the Chikurubi Maximum Security Prison Psychiatric unit. Emmerson says, his story, while extreme, explains the situation many patients find themselves in, when their illness is left undiagnosed and untreated. “When you are a professional, you realise that the patient committed a crime because of mental illness and they need help," he says. "No matter how heinous their offences are, they still need help. The gap in resources isn’t the only challenge patients face: for many, the stigma can be even more debilitating. Emmerson’s friends sometimes tease him. Emmerson says it’s words like these that remind him just how misunderstood mental illness is. “Some may think it is not worthwhile working in prison," he says. "But then again you ask yourself - if I don’t go into prison to help mental health patients, who will? “My wish is to see a shift from institutionalised mental health services to community mental health services. Mental health patients and nurses perform dance therapy. "I want to see patients getting services closer to home in their community rather than being institutionalised. We have been supporting the Zimbabwe Prisons and Correctional Services (ZPCS) to provide diagnosis, treatment, care and support. We have supported inmates with psychiatric disorders, HIV and TB at the Chikurubi Maximum Security prison psychiatric units since May 2012. We have also been supporting eight other selected prisons in the Mashonaland Provinces with mental health training programmes. In October 2015, we launched a mental health project at the Harare Central Hospital Psychiatric Unit. The organisation has since constructed an outpatient departmentand renovated the male and female acute and sub-acute admission wards with 100 beds. 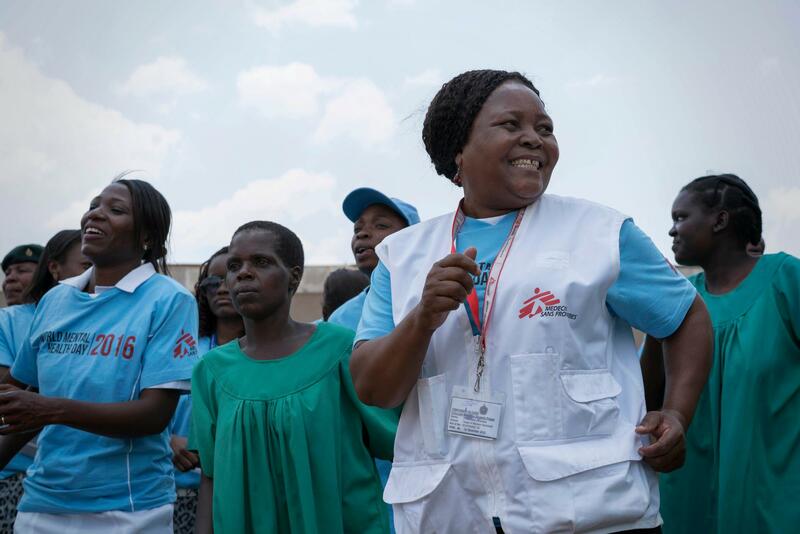 MSF also provides community mental health services through the discharge team which follows up discharged patients to review them at their nearest clinic in Harare.